Mother’s Day is just around the corner and some of my friends have either become first time mothers, or grandmothers. They often ask me for suggestions for books, and of course, I am eager to oblige. There are new ones to be had, with great and grand reviews, too. I couldn’t have turned a better phrase myself, for that is exactly what the reader can expect from sharing “Peek-A-Boo” with an infant or child. 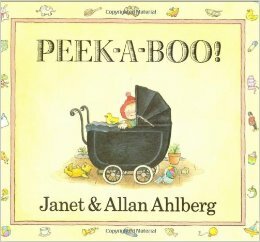 From the moment you take in the cover a sweet carrot topped baby peering out from a black pram, you and your little one are welcomed into the warm and wonderful world of Janet and Alan Ahlberg’s “Peek-A-Boo.” And what a wonderful first look around for a baby, or even adult for that matter, it is. The book, with its progression of circular hollowed out pages, provides pictures and rhymes that illustrate exactly what an infant to toddler sees – from their own perspective, when they look out the window of their own limited view. Boring? Not in this Ahlberg’s assembled baby’s universe! The Ahlbergs have shown with amazingly fresh and nostalgic detail, that your infant/toddler’s perspective on their wider world is much larger than you may imagine. They take in everything and everyone in large and small detail in their corner of the world. But what if the roles were reversed? What does the baby see when he sees you… and everything else besides you. With a hairnet on her head. It may seem from the above line that not much is going on in this baby’s world, but you’d be wrong. Just wait till you see the illustrations. They’re loaded with detailed touches of homey household realities, from flowered bedroom wallpaper, to dresser drawers overflowing and barely closed, army jackets ( Dad’s in the service) hung over a chair, the traditional wedding picture hung near the bedstead, and baby toys are everywhere, in plain sight. The Ahlberg’s art paints a picture of a very lived-in family life in motion, and completely at ease with a bit of disarray…. in a word, normality. With the baby’s eye view progressing in pages, from highchair to stroller to carriage, to outdoors on a checked blanket, to sister’s lap, and even a bird’s eye baby bath tub vista, his world view widens, along with ours. He is the lens through which we see mom doing windows, bonfires smoking, grandma’s shawl tassels gently wafting in the wind at a park outing with both reader and listener eager to find and take in the artistic renderings of what the baby’s words perceive in the life that surrounds him. The Ahlberg’s Peek-A-Boo picture cut out visuals are cozily complex, completing this decidedly British feel for a baby’s world that is surrounded by a comforting content, that is both soothing and stimulating at the same time. Now that, in itself is a combination pretty difficult to achieve. But the husband wife team of Janet and Allan Ahlberg have done it. So this Mother’s Day, if you are a bit nostalgic over past “Peek-A-Boos” played, or if there is a new baby in your life you are eager to play it with anew, Janet and Allan Ahlberg have taken this classic baby game to new heights via their picture book of the same name, as they have set the bar quite high, in both originality and art. It’s a highly recommended first book just perfect for new moms this Mother’s Day! this is an old favorite, with its compelling art and charming rhymes.